Reverse pulse jet type bag filter consist of non woven polypropylene bags, Aluminum casted ventury, wire cage and air pipes . 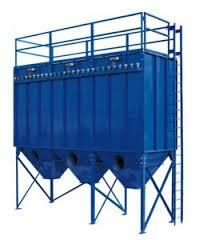 Function of this bag filter is filter air passed from bags and dust particles stick on bags. Then after some time interval compressed air blow in bags, bags will be vibrating and dust particles fall down in hopper. The dust collector is available in multiple of bag range like, 16, 25, 36, 49, 64, 81, etc… and height to suit with customer premises. Which is most useful to control the emission level. Bag range 16, 25, 36, 49, 64, 81, etc.